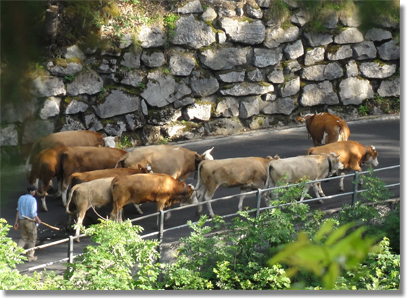 Sitting on the balcony of Chalet Heimeli, our home away from home for nine days, the mid-seventies day beginning to cool, I’ve become aware that a parade of cows, their bells clanking, has created a traffic jam on the narrow, winding lane leading out of town and up the mountain to the now-grassy ski area. 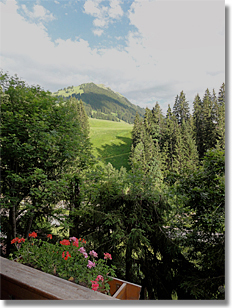 It’s 7:15 pm, a Friday-late-June rush hour in Gstaad. The Bernerhof was “the hiker’s hotel,” according to one local website. Indeed, one couple staggered off after several lagers with the kind of modified ski poles one needs to get up and down the trails I’ve been told surround us. Or they may have needed them to get back to their room. I know I would have had a tough time seeing the ball, if I’d been going to the courts. Skip wine at lunch, I made a note to myself. We’d arrived a couple of hours earlier, after a seven-hour flight from Newark on United that brought us into Geneva, a jewel of a city sitting on the lake of the same name, surrounded by mountains flecked with specks of snow at their peaks and, just beyond, the towering all-white slopes of Mount Blanc. A car and driver took us the rest of the way, the roads growing narrower the higher we climbed, the leafy trees morphing to evergreens, the mountain walls steeply closing in. When I’d first begun thinking about this trip—at John Newcombe’s Tennis Ranch in New Braunfels, Texas last fall, where Roy Emerson had been one of the featured “Legends” and the captain and coach of one of the four teams competing during the week (not mine)—I hadn’t really visualized the setting. I vaguely remembered Gstaad’s role in the Peter Sellers film, The Return of the Pink Panther, but mostly that it took place in winter, and that skiers had been jumping off roof-tops. Now, as we walked through the town’s main streets, several thousand feet above sea level, with the tallest nearby peaks several thousand feet higher, it seemed remarkable that Prada, Cartier, and every posh watchmaker in the universe had decided to set up shop here, of all places. But the celebrity of Gstaad seems etched in stone, or metal; a cast bronze of a small calf sipping water from a trough stands at one street corner. The donor, says a plaque, was Elizabeth Taylor; the artist, her daughter. We were about as far from the Texas plains as you can get. Preparing for the week wouldn’t be the same either. For the Legends week, it had been about getting ready for serious competition, leavened by camaraderie and beer, more than likely Bud. For Gstaad, it had been … well, anticipating that Swiss wines unavailable in the USA could be purchased at the local cafe, and learning which cheeses worked best in a fondue. Lesley recalled a white merlot she’d sipped a decade earlier. I tried to remember the difference between raclette and rosti. The schedule, which I’d received from Roy’s wife Joy a week or so before departure, called for about five hours of tennis a day, starting with a welcome cocktail party on Sunday, and an evaluation session on Monday. Joy had told me that most attendees got it when they arrived at their rooms at the Palace, but since we were staying off-site—an accommodation not afforded most players due to the agreement between the Emersons and the hotel management—we got an early look. Each morning and afternoon would be devoted to a specific stroke, beginning with the forehand and backhand on Monday. There would be a demonstration by Roy, then individual coaching, then some informal doubles play. No one would be keeping score, as far as I could tell. In the middle of the week, there would be an afternoon picnic in the Alps. On Friday night, a farewell dinner. The goal would be game improvement, and optimism was in the air. “Have a great week,” exhorted the Emersons on their Tennis Week schedule, “and do not forget to pick up next year’s Wimbledon entry forms at the Front Desk.” I assumed that would be the All-England winetasting competition. On Friday, our first night in Gstaad, our chalet host Tom Widmann brought us to the Palace’s restaurant for dinner. The maitre d’, Gildo Bocchini, is a local hero of historic proportions—he is on intimate terms with, one publication pointed out, “kings, divas, presidents, musicians.” Even so, he greeted us warmly. I began to wonder which category Widmann fit into. In the back room, Emmo’s farewell party for this week was underway. We ordered a bottle of Tiganello Antinori, which I’m told is rather special. Gildo excused himself, and in a moment, we could hear his voice in song, an operatic melody surrounding us as we swirled the carefully-decanted red. Soon he returned, to swirl his own glass of the Tuscan grape. Another voice rose in the back room. “Waltzing Matilda, waltzing Matilda,” sang Roy Emerson, and his charges joined in chorus. Instantly, I was taken back to Texas and the Legends final night. Smiling, Gildo stood over us, and raised his glass. What on earth, dear man, are you trying to undo from your long and twisted, legendary tennis past? No matter how many Legends you find to coach you in your old age, whether in Texas or Switzerland, with whatever stroke it is you’re searching for, you will always be the kid I beat that day at the Club with a warped, wooden Spalding racquet with broken strings. But seriously, I’m jealous as hell, all the while wishing you two a fantastic week — awash in Bud, while supping on Swiss fondu beaujoulais supreme au jus as you nurse your blistered feet while trying to find your glasses ! !